To stimulate sales of Morgan sports cars, it was decided to venture into an area not previously considered by the company - glassfibre. Furthermore, the new model would no longer incorporate a wooden frame made of Ash, as had been the case in all previous models. 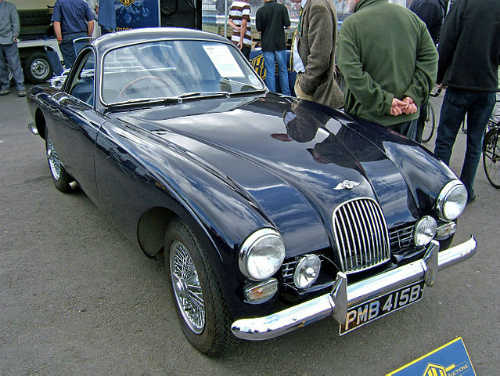 The body styling finally agreed was based upon a fixed head coupe design, with additional touches of luxury including, for the first time on a Morgan, wind up windows, a curved windscreen, and locks on the boot. Without doubt, this was a bold move by the company, since it represented a complete departure from the philosophy of the previous half century. The prototype was subjected to rigorous testing, including entry into a number of trials, in order to assess its dependability and driving characteristics. Consequently, the Plus Four Plus was introduced to the market, in 1963, at the Earl's Court Motor Show, and backed up by an advertising campaign. This was the first fixed head coupe that Morgan had built in its long and illustrious history. The body styling was fairly advanced for its time, and consisted of a glassfibre body on a Plus 4 chassis, which had been duly strengthened. As a result of the hard suspension, there was minimum body roll even when subjected to demanding driving. The two seater, fixed head body was made of fibreglass, which greatly reduced the cars' overall weight. As a result of its aerodynamic shape, the performance was slightly better than that of the Plus 4. Furthermore, due to the body styling, the interior space was increased which produced, amongst other things, ample leg room, even though it was a little noisy inside. Initial reaction from the market did not meet the company's expectations, possible due to the fact that it was such a departure from the accepted norm. Unfortunately, it did not appeal to the traditional customer of Morgan sports cars. In a most unexpected quirk of fate, although the market had, in reality, shunned the new car, sales of the existing models experienced a boost. This left the company in no doubt as to the most appropriate course of action to take. Accordingly, after a production run of three years in which only 26 units of the new model were built, the car was finally phased out. Following its demise, the company withdrew from producing such "out of character" models, and reverted back to its roots of building traditionally styled classic cars. Subsequent to the ending of production in 1967, the car was regarded, for some time, as not a true member of the Morgan family. However, time is a great healer, and the car is now regarded as highly desirable, not only for its advanced styling at that time, but also for the fact that it was, quite literally, a limited edition model.